As I walked across the parking lot and started to get into my vehicle after having preached in the Sunday morning service at a church in Texas recently, I noticed these little flowers growing in the midst of nothing but rocks. No grass. No other plants. They looked so out of place. But there they were… just growing and beaming brightly. They brightened my day because they reminded me that God can cause us to flourish regardless of our situation. I’m reminded of Isaiah 35 as I think of them today. It is a chapter of hope. It speaks of how God can bless when and where He chooses, regardless of how bleak the situation appears. Today, you may be going through a difficult time. Perhaps your health is under attack, like a couple friends of ours are right now. Or maybe you’re facing some financial challenges that have your back against a wall like another person I know. Or maybe you’re going through a drought in the area of friendships. Know this… God doesn’t need your situation to be perfect… or optimal… or favorable… or even okay… to cause your life to blossom right now! He can cause life to spring out of death. He can cause health to spring out of sickness. He can cause abundance to spring out of lack. He can cause companionship to spring out of loneliness. What looks impossible to you is possible with Him. 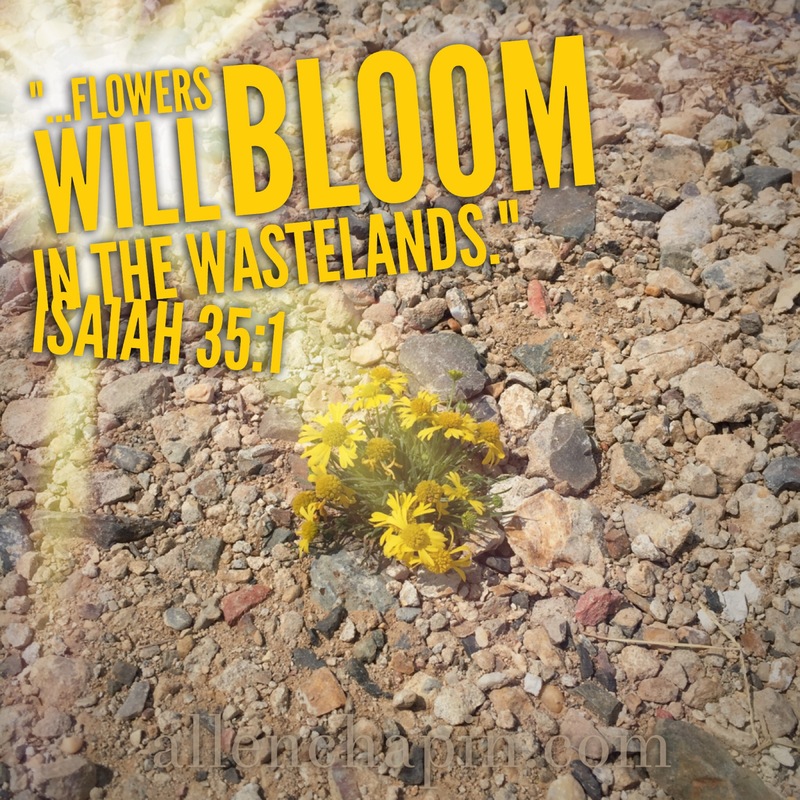 You may think you’re in the wrong place, but don’t worry because at the right time God can cause your life to push up through those desert rocks and bud… and bloom… and blossom into fullness! Why not take some time to look up the 35th chapter of Isaiah today, and find encouragement there? Even if you are not a believer in Christ yet, that chapter is full of the kind of hope I’ve found in knowing Christ personally and following Him. I believe that if you’ll open your heart to Him, you’ll find that same hope.